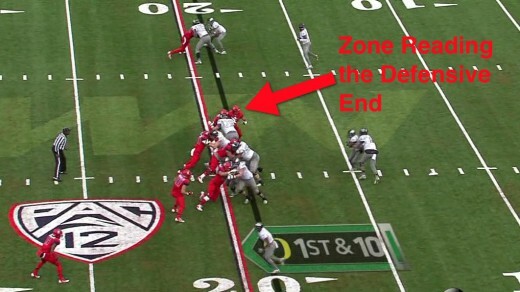 Oregon has an “Open Gap” Zone Read! We CAN learn something new from an ugly loss and not just looking at why we lost! In the past two years I have noticed a new movement taking place in the backfield that at first I identified as a new “Universal Formation,” and now with new, up-close footage, we can better determine the part it plays in our offensive attack. 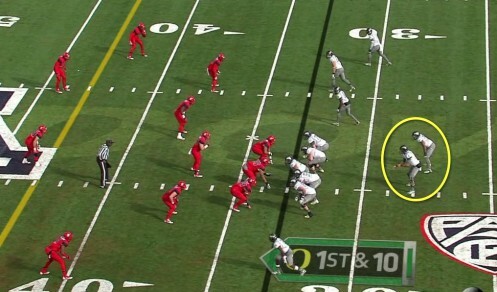 Let’s forget about the game, and examine a new trend in the Oregon running game instead. What you see above is an Inside Zone Read play, but can you tell how it is different from other IZR plays of the past? Did you notice the differences before? Why would this play variation appear? We see (above) the classic Inside Zone Read backfield formation of the past where the RB lined up about five feet behind and a yard to the side of the QB. The flow of the RB is to pass in front of the QB, as they do their mesh of Zone Reading, and if the RB gets the hand-off, he targets the gap between the guard and tackle on the opposite side from where he began. Typical stuff. Note how the positioning at the beginning of this Sweep Read play (above) for the RB is only about a foot behind and to the side of the QB as the play starts. The RB runs across the face of the QB in a perpendicular fashion in this Sweep Read play and, for easy duplication, the Outside Zone Read is done the same way. It’s fairly easy to discern the differences in the backfield formations and the plays that are coming. We have done well with the Power Play! It’s easy to be fooled on a Power Play thinking that it is an Inside Zone Read. 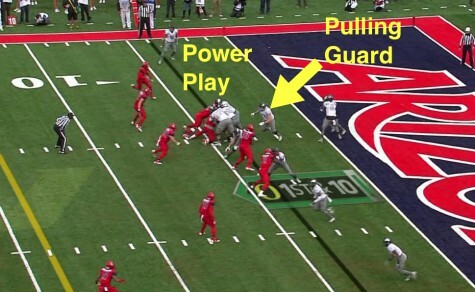 The key to look for is the offside guard (above) pulling to lead the way. We run a ton of Power Plays (above) and defenses are doing a good job of stopping it the majority of the time. Usually the Inside Zone Read and Power Plays are designed to attack a particular side of the defense. But what if you could attack BOTH sides at once? The beginning looks familiar . . .
As we begin looking at this new Inside Zone Read variation (above), note the placement of the RB being very similar to the Power Play, and not as deep behind the QB as in the original IZR. You don’t see this often . . .
How interesting is this? The RB moves toward the QB and takes a step backward! He is now going straight and forward in a similar way they do in a Pistol formation, and not across the QB’s face, as was done in the original Inside Zone Read. We still do Zone Reading of the DEs. At the key moment of the mesh (above), we see that the QB is Zone Reading the defensive end, (the right tackle, Fisher, is blocking a LB who tried to blitz) and once it is established that the DE is sitting and the lane is closed to the QB? The handoff proceeds to the RB, as usual. What is NOT typical is how the RB has the ENTIRE line of scrimmage to assess, and thus the name of “Open-Gap” Zone Read. 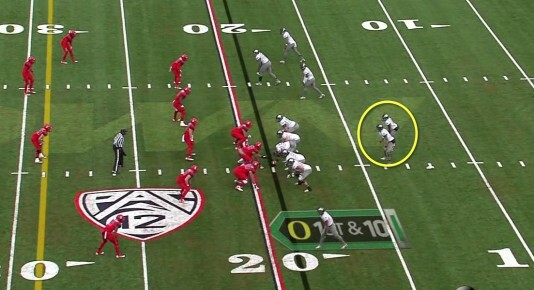 The RB quickly finds and runs to the open gap on either side of the defense! This is not the usual Inside Zone Read that we watched Chip Kelly base his offense upon, yet I think it is an excellent adjustment to what the defenses are doing to stop the IZR. 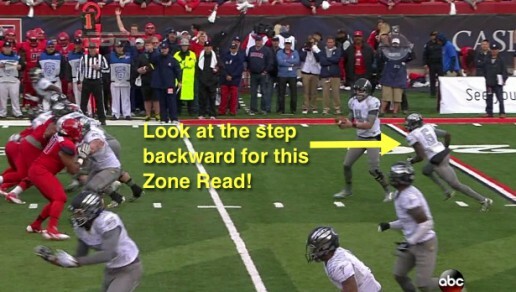 The fact is — the “Open-Gap” Zone Read is not new to the Oregon offense, as it has been around up to two years, although it was used sparingly and only as needed for the majority of the prior two seasons. However, now it appears that it is being used primarily as the Inside Zone Read weapon of choice to complement our Outside Zone Read and Sweep Read plays. Why feature it for this game? It was an awful game and frankly I could not see how to pull some good out of it until I saw the up-close footage of this new play variation. 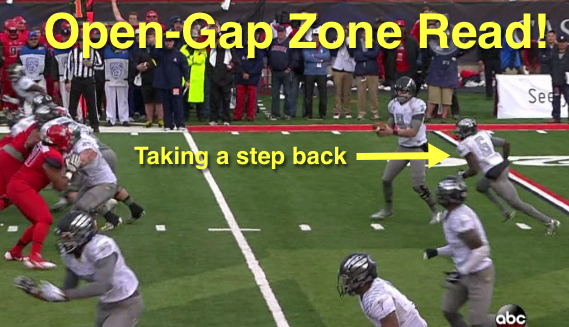 It was just what I needed – to explain and introduce the “Open-Gap” Zone Read! The blocking for the play (above) is the usual zone blocking with the offensive linemen chipping together at the down defensive linemen, with the uncovered offensive linemen moving out to engage the linebackers, as we would normally do in an Inside Zone Read. Like before, the defender being “read” is not blocked, which again leaves us with an extra blocker to work with against the opposing defense. And what if the opportunities are best outside? The RB can pop it out there, if need be! My feathered friends — I am not going to put my head in a hole and declare that nothing is wrong, when we all know something is with our football team at this time. I feel that my place is not to analyze that part of things now, but to focus on the positive, and to continue to learn about the wonderful game of football and how Oregon attacks with their offense and defense.